A remake of the Pastel dress, with a yarn that reminds me of the seashore — the different shades of blue in the distance, the greens of algae and seaweed washed up on the rocks. 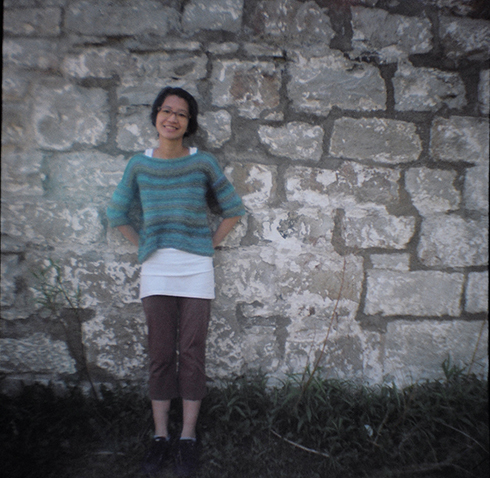 Similar to the remake of the Ginkgo top, this sweater uses the same lace pattern as the top of the Pastel dress (which was a variation of the Ginkgo lace pattern), minus the armhole shaping and with a simpler boat neck shaping. Length is easily adjustable by working more or fewer rows. Width can be adjusted by adding or subtracting stitches in the foundation ch by multiples of 6. With 5 mm hook, ch 85. Row 1: dc in 6th ch from hook, skip next 2 ch, dc in next ch, [skip next 2 ch, fan in next ch, skip next 2 ch, dc in next ch] to end, [dc, ch 2, dc] in last ch, turn. Row 2: ch 3, skip first dc, fan in dc between fans, [dc in 2nd dc of next fan, fan in next dc between fans] to end, dc in 3rd ch of turning ch, turn. Row 3: ch 5, dc in 1st dc, dc in 2nd dc of next fan, [fan in next dc between fans, dc in 2nd dc of next fan] to end, [dc, ch 2, dc] in turning ch, turn. Repeat rows 2 & 3 until there are 34 rows altogether, ending with row 2. Row 35: work in pattern to the 4th fan of the row, dc in 2nd dc of the 4th fan, dc in next dc between fans, turn. Row 36: ch 5, dc in next dc, dc in the 2nd dc of next fan, work in pattern till end, turn. Row 37–38: work in pattern. Fasten off. Attach yarn to the other corner of row 34, repeat rows 35–38. Repeat pattern for front until neck shaping. Work 2 more rows so that there are 36 rows altogether, ending with row 2. Row 37–38: repeat rows 35 and 36 of front. Fasten off. Attach yarn to the other corner of row 36, repeat rows 37–38. With right sides together and wrong sides facing, sew shoulder seams together. With right sides together and wrong sides facing, sew side seams together, starting at the top of the 11th row from the top of the sweater. Turn sweater right side out. Neckline: attach yarn to a dc (not part of a fan) on the back of neck. ch 1, sc in same dc, [sc in 1st dc of fan, sc in next ch 2 sp, skip 2nd dc of fan, sc in next ch 2 sp, sc in 3rd dc of fan, sc in next dc] around, sl st in beginning sc of found, fasten off. Armholes: attach yarn to any space on the armhole. We will be crocheting into the side of the rows, or what I call “row‐ends”. ch 3, work 2 dc in each row‐end around, sl st in top of beginning ch 3, fasten off. Repeat for the other armhole. Bottom edge: attach yarn to any ch 2 space, ch 3, work 1 dc in every ch 2 space, every base of a fan, and every base of a dc, sl st in top of beginning ch 3, fasten off. I recently received a lovely email from a friendly staff person at Warby Parker inviting me to write a post about my summer moments and to pick some of their sunglasses to go with them, for their #seesummerbetter campaign. While I’m not receiving any material or monetary compensation for writing this post, except perhaps friendly shout‐outs from the Warby blog, I’m still feeling rather flattered that there is interest in this blog, especially since Mike just got a pair of glasses from them and he quite liked them, and had been telling me good things about the company, including friendly and approachable customer service :) Another thing that attracted Mike to shop from them is their Buy a Pair, Give a Pair program, which doesn’t only create access to affordable glasses, but also opportunities for skill‐building and employment. So I was happy about writing this post. But there is one problem: I don’t usually wear sunglasses. It’s kind of a foreign topic to me and I don’t really know what to write about. Not that I don’t like wearing sunglasses. I think they’re very important for eye health. I’m just rather utilitarian about it (among many other things). I used to own a pair of sunglasses that I bought from the drug store, they go over my regular glasses (as in wearing two pairs of glasses at the same time). But then I got new glasses that are a lot wider than my old pair and the sunglasses can’t fit over them. And I never bothered to get a pair of prescription sunglasses. So I haven’t been wearing sunglasses for a few years now. Probably not good for my eyes, especially in the summer. The invitation to write this post might actually be a good reminder that I need to get myself a pair of prescription sunglasses soon… and maybe I’ll think a bit more about style rather just utilitarian this time (sunglasses that go over regular glasses aren’t the most stylish ever :S). So I sort of interpreted the invitation to write this post as: if you were to buy a pair of sunglasses from our shop, which ones would you consider? 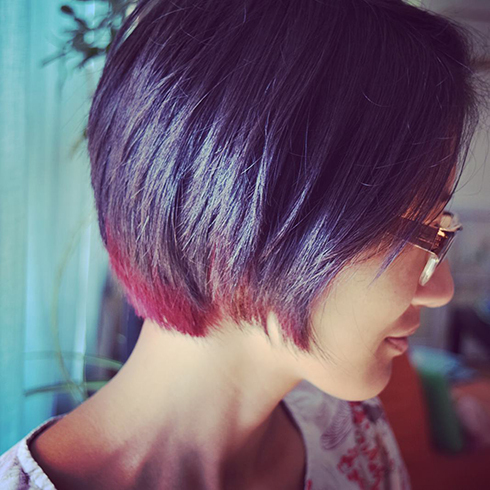 Last week I got my hair cut and coloured :D I’m quite happy with the vibrant but not too bright colour showing from underneath. I have an affinity for grey glasses, so I think the new hair would look great with these :D And with a beautiful name like Luna Fade it’s hard to not like them. 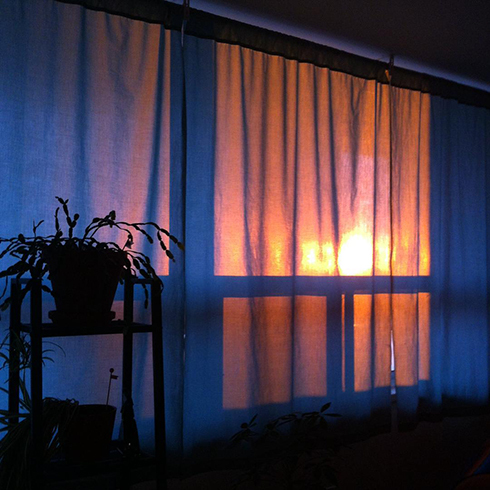 Have I ever shared pictures of the curtains I finally sewed and put up? It’s only taken me 8 months! :S For the longest time we had disposable plastic table cloths taped to the window… but now we have these sea glass coloured curtains! :D And look at the glorious blazing summer sunset shining through. 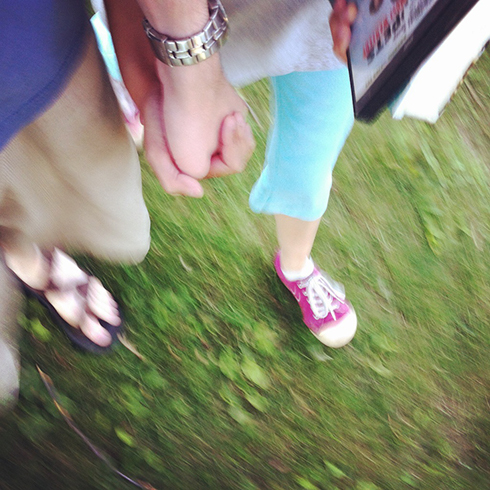 And today we had the perfect summer evening — sandals, cotton‐candy‐colour pants, trip to the library at 8pm in daylight! And what goes well with cotton‐candy‐coloured pants? Thanks for window shopping with me! :D Hope everyone has a fun and sun‐filled weekend! Woohoo! Balloon ice creams, perfect photo booth prop for summer parties :D From my favourite party blog Oh Happy Day. A friend pointed me to this cute knitted snail from Hobby Craft. Lovely gold twig hair pins from Love Maegan. 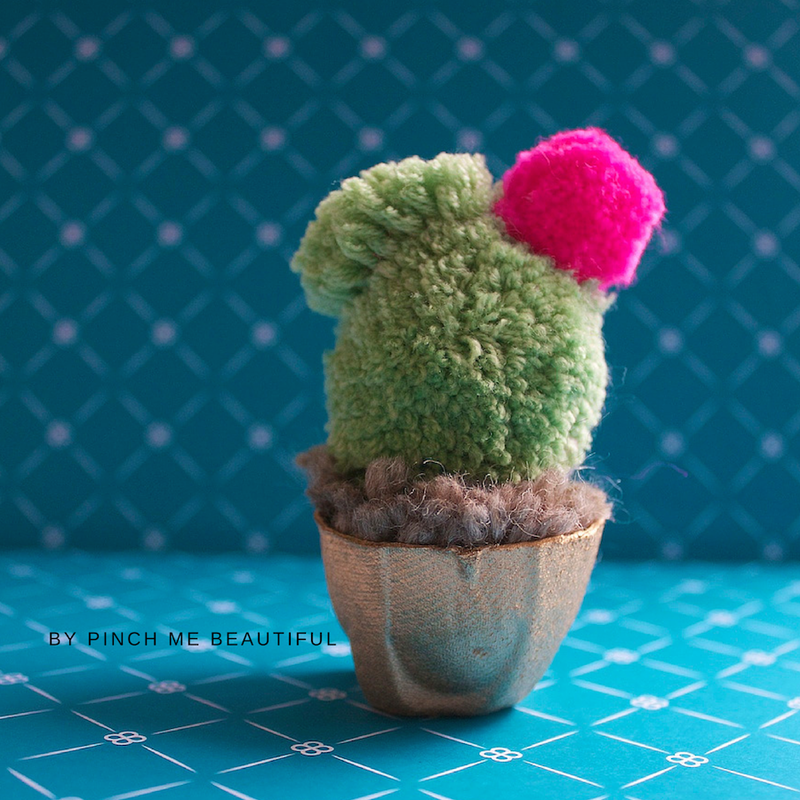 Clever, simple and super cute pom pom cactus, from Pinch Me Beautiful. 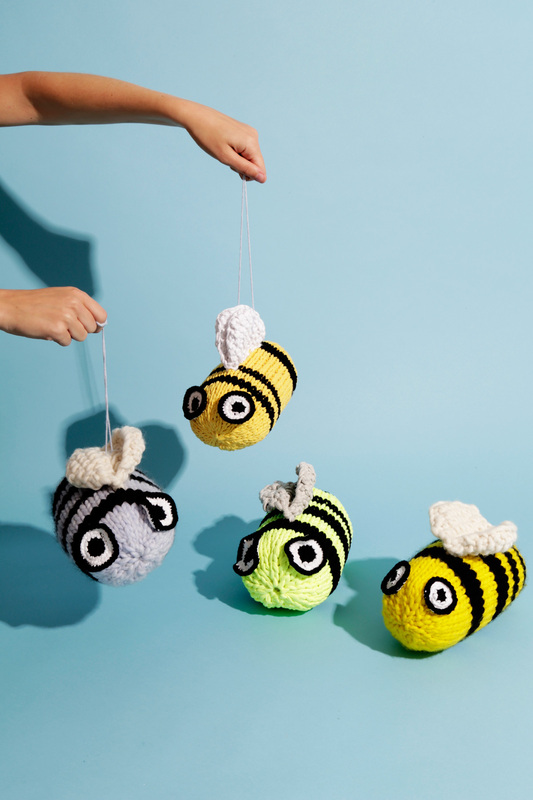 Hop to Wool and the Gang for this adorable knitted bee pattern and learn more about saving the bees! 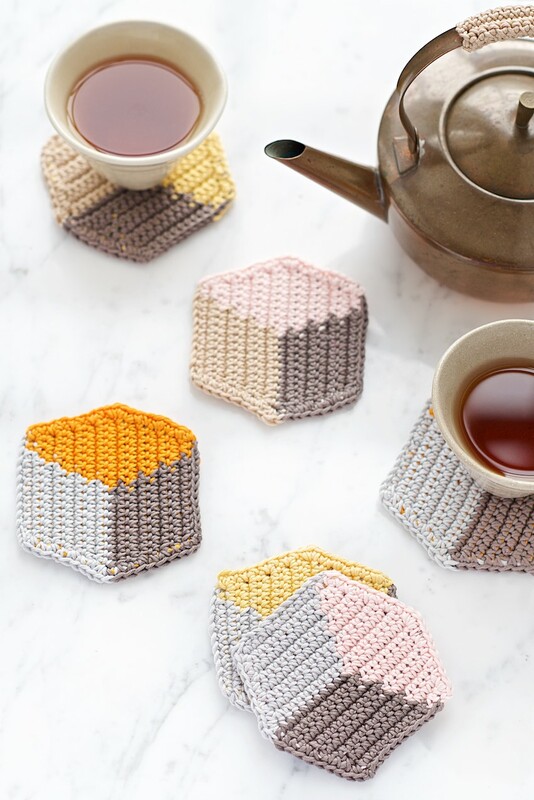 Something very stylish about these coasters. From Lebenslustiger. A floor pouf! I’ve always liked the idea but didn’t feel like buying a ton of Polyfil. This one doubles as a secret storage — how smart! For pillows and extra blankets and such! From Chaleur Life. 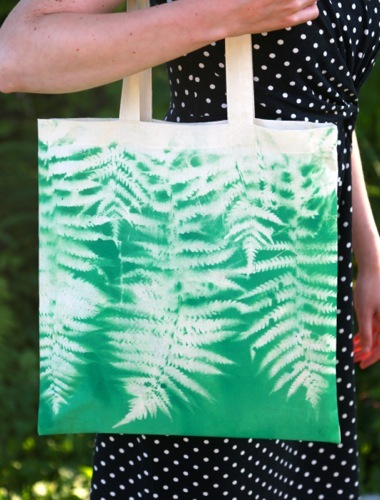 Beautiful summery tote, by Aunt Peaches on I Love to Create. The feather was made with shrink plastic. 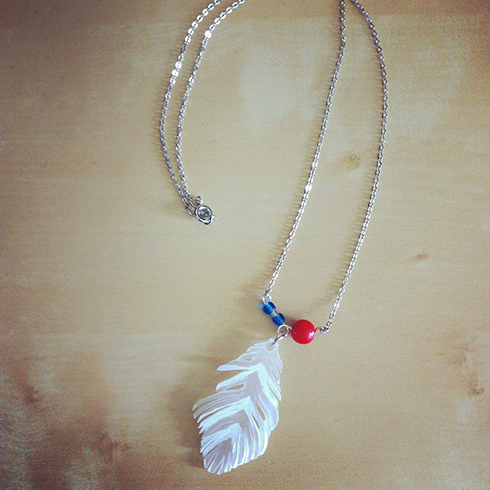 I might make more of these, maybe with different colour chevron stripes! The stones were gifts from a friend so this is definitely not going to the shop. 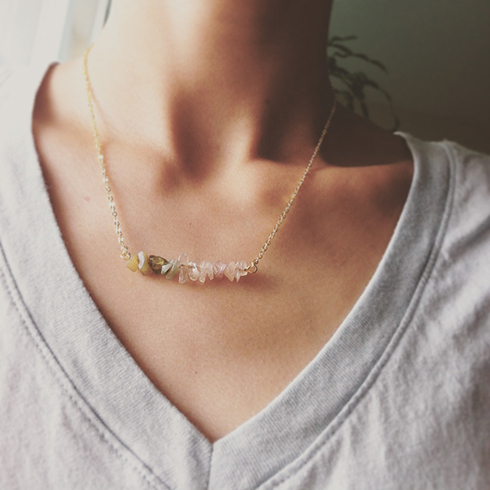 But this was the first time I tried making this style of necklace and I think it worked out well, so I might make more of this too if I can find similar drilled stone chips (not sure if that’s what they’re called :S). Bean and Baker! 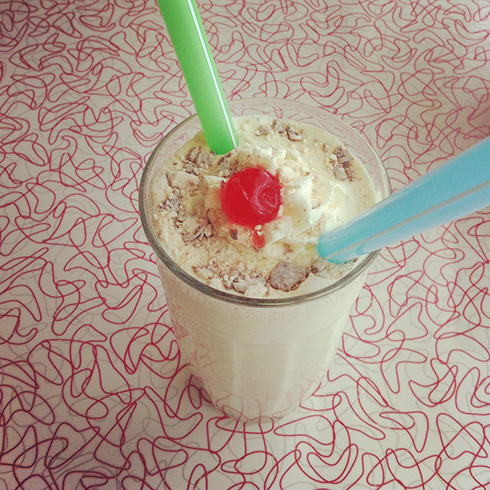 We had a vanilla malt shake, which was dreamy. 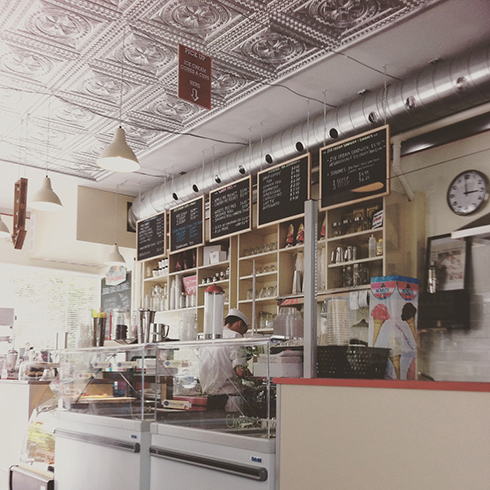 They also have pies of both sweet and savory varieties, and handcrafted sodas! I highly recommend a visit if you’re in the neighbourhood! This is not lately, we went there back in May, but haven’t had a chance to post these photos. During Doors Open Toronto we went to the Gibraltar Point Lighthouse on the Toronto Islands, which is the oldest lighthouse of the Great Lakes! 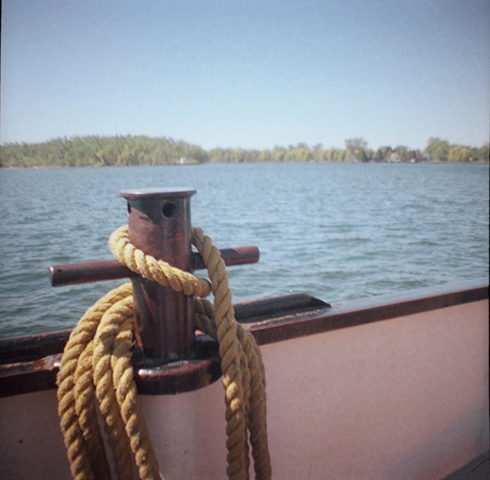 (Also supposedly haunted :S) I followed the Roundograph tutorial by Photojojo to mimic photos taken by the Kodak No. 1 in the 1890s. Here’s one with a different filter, which I also like very much. 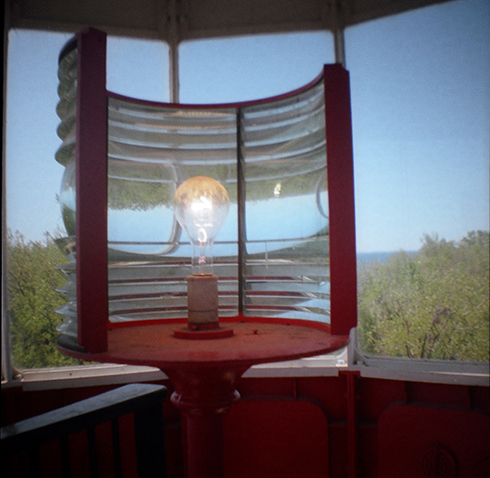 I also took the Diana to the lighthouse. 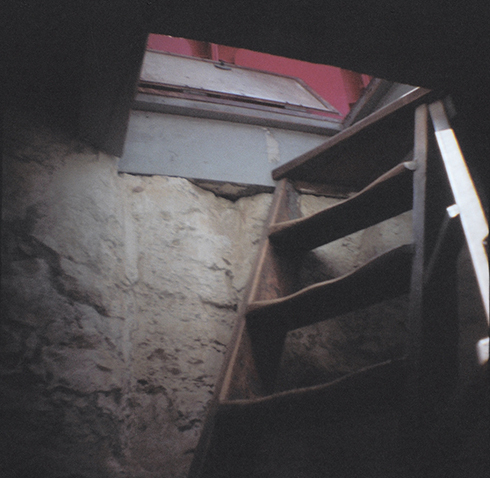 Here is the ladder leading to the top of the lighthouse. It’s my favourite picture of the batch. 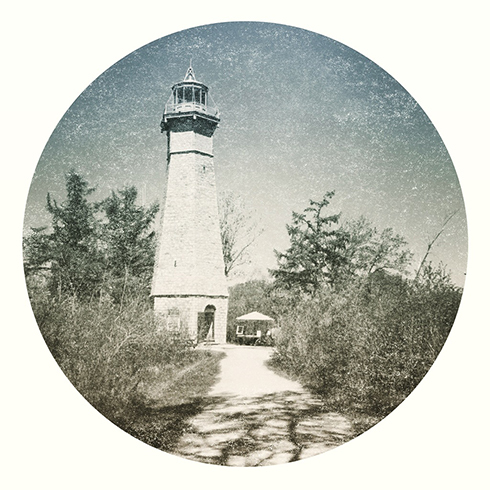 Me at the foot of the lighthouse. And on the ferry between the island and the city. 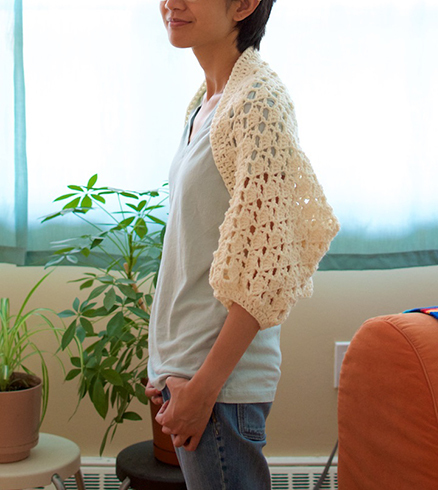 This shrug uses the same lace pattern as the ginkgo top (and almost the same stitch count! ), but with much heavier yarn and larger hooks. Basically, a blown up version of the ginkgo lace pattern. And no neck shaping! Isn’t that nice? :D Such is the beauty of shrugs. I thought it would make a nice piece for late summer nights easing into fall. With larger hook, ch 136. Row 2: 2 dc in 4th ch from hook, skip 2 ch, dc in next ch, [skip 2 ch, 5 dc in next ch, skip 2 ch, dc in next ch] across, skip 2 ch, 3 dc in last ch. Turn. The rest is just the same as the ginkgo lace pattern. To make things easier I’ve pasted it below. Row 3: (WS) ch 5, skip shell in the beginning of row, dc in next dc, [ch 2, dc in 3rd dc of shell, ch 2, skip rest of shell, dc in next dc] across, ch 2, dc in top of turning ch. Turn. Row 4: (RS) ch 3, 5 dc in next dc, [dc in dc, 5 dc in next dc across], dc in 3rd ch of turning ch. Turn. Repeat rows 3–6 until piece measures approx. 18″ from beginning, or desired length. Ending with row 4 or 6. Fasten off. Fold piece in half lengthwise with wrong side facing out. Sew seam together, starting from the cuff edge, along the long side of the piece, sew 5.5″ towards the centre of the piece (about 3 and a half shells). Repeat on the other side. Turn piece right side out. Neckline/front/back: With larger hook and right side facing, attach yarn to any stitch along the last row crocheted, ch 3, dc in each dc except the 3rd dc of each shell. 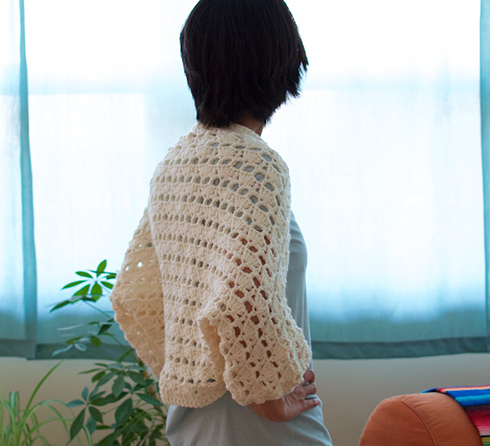 When crocheting along the bottom side of the shrug (i.e. along the foundation ch), work 2 dc in each 2 ch space, and 1 dc in the base of each shell, but skip the ch at the base of a dc. 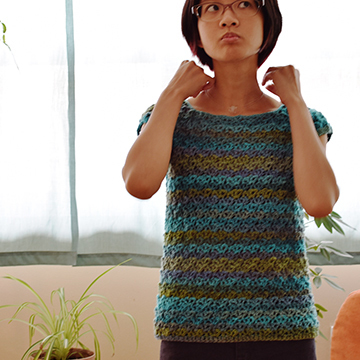 Crochet around until end of round, sl st in top of beginning ch, ch 3. Do not turn, dc in each dc around, sl st in top of beginning ch, fasten off. Cuffs: With smaller hook and right side facing, attach yarn to any space on cuff edge. 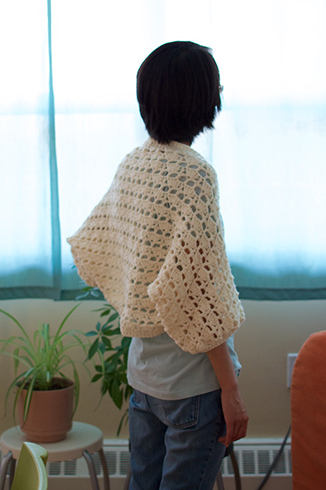 The stitches will be crocheted into the side ends of the rows, or “row‐ends”. ch 3, 2 dc tog in each row‐end around, sl st in top of beginning ch, ch 3. Do not turn, dc in each dc around, fasten off. Repeat on the other cuff.